MOSCOW (Bloomberg) -- The love wealthy Muscovites have for Elon Musk is costing them dearly. Almost 100,000 Russians follow Musk’s unofficial social media page, yet the Tesla founder seems to be promoting his dream car everywhere but here, forcing enthusiasts such as Andrey Vratskiy to go to great lengths -- and expense -- to own one. Vratskiy, a 33-year-old software executive, wanted to swap his BMW X6 for a $75,000 Tesla S so badly that he agreed to pay almost double for it. With no sales network in Russia, he had to buy his sedan in the U.S. and spend $12,000 to fly it to Moscow, where it cost $50,000 to clear customs. When he first started driving his ocean blue Tesla two years ago, Vratskiy said he felt like an endangered species in the wild. Now he’s roaming with dozens of other members of the fan club he started and has spotted about 250 more. “I love gadgets and this thing is pure gadget, like an iPhone on wheels,” said Ivan Streshinskiy, who manages most of Alisher Usmanov’s $14 billion fortune as head of USM Advisors. He bought a white Model S last summer and is shopping for a red one. Other Russian owners include billionaire Roman Abramovich and bankers Herman Gref and Andrei Akimov, who head OAO Sberbank and OAO Gazprombank, Russia’s largest and third-largest lenders, respectively. For Gref, who served as economy minister during President Vladimir Putin’s first two terms, not even the U.S.-led sanctions that severed his bank from the global financial system can curb his appreciation of the American machine. “It doesn’t pollute nature and it’s super cheap and easy to use,” Gref said by email. With such prominent customers already happy and a moneyed class famed for bouts of conspicuous consumption, Tesla could easily sell 2,000 Model S sedans and 2,000 of its upcoming Model X SUVs a year in Russia if it paid as much attention to this country as it does to China, Vratskiy said. Musk was greeted by rapturous crowds when he traveled to Beijing and Shanghai on a promotional tour last year. 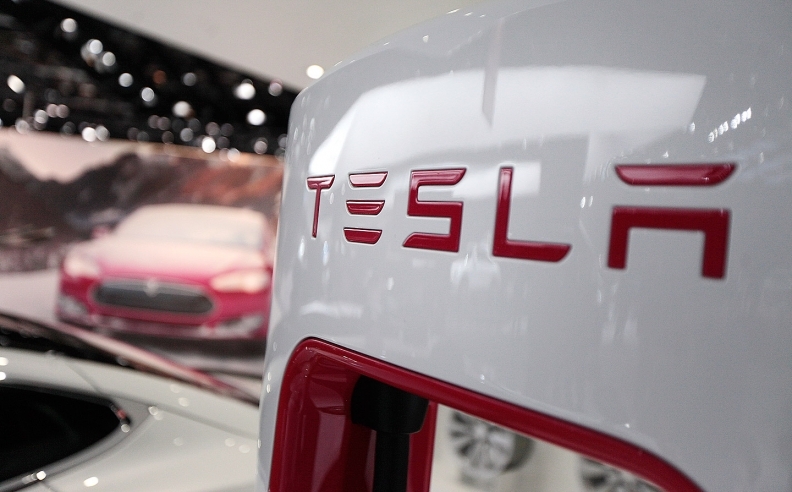 Tesla Motors Inc. had global revenue of $1.1 billion in the first quarter, the same amount Russians spent on luxury cars in January through May, according to market researcher Avtostat. The company said last week it delivered 11,507 Model S sedans in the second quarter. It aims to deliver 55,000 vehicles globally this year. Vratskiy said he and other members of the Tesla fan club have written to the company several times to urge it to expand into Russia, but the answer is always the same -- the country just isn’t a priority. Tesla said it doesn’t sell its vehicles in Russia, so it doesn’t “provide warranty, charging solutions, service, or assistance with the necessary steps to legally import” its cars. It had no comment about when it might enter the market. With relations between the U.S. and Russia at their worst in a generation due to Putin’s support for the rebellion in Ukraine, that position seems unlikely to change anytime soon. For Musk, a 44-year-old native of South Africa, entering the Russian market is complicated by another of his businesses: closely held SpaceX. Formally known as Space Exploration Technologies Corp., it won U.S. Air Force certification in May to conduct military missions while a joint venture of rivals Boeing Co. and Lockheed Martin Corp. is being limited because of political pressure over its use of Russian rockets. With no entry in site, Tesla enthusiasts in Russia like Vratskiy will have to continue paying a premium to the private traders that are stepping in to meet demand. Two dozen Model S cars are currently being advertised on Avto.ru, the country’s largest online marketplace for vehicles, for as much as 11 million rubles ($195,000) each. But Tesla buyers beware of the Moscow fender bender: The nearest service center is in Finland, about 550 miles away.